Game Remains: Golden Horseshoe, Postcommodity, 2013. Image by Vanessa Tignanelli. Community can be fostered through music by individuals, spaces, events, and moments. Collaborative spirit and camaraderie fuels the music network and creative utterances. The Musagetes Guelph Café featured a collective sonic improvisation by the media art collective Postcommodity. 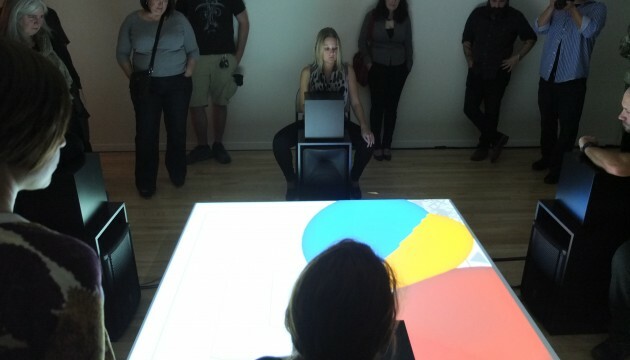 Guelph community members collaborated with Postcommodity on developing a multi-media sound instrument and video game played by groups of four people. The resulting interactive instrument, Game Remains: Golden Horseshoe, was performed live, first by the artists, then by their collaborators. Each performance resulted in a unique improvised soundscape using the video game as a sonic instrument. The artists describe their practice as a shared indigenous lens, and those present for the performances witnessed a type of contemporary music-making ritual drawing upon the history and tradition of the drum circle.